Did you know that people actually die from a weak EQ? Ok, maybe things aren’t that bad. But your emotional intelligence is tied to your habits and behaviors, which make a difference in your lifestyle choices. If you make ones that harm you, then you might not do so well in the long run. Let’s dive into the research that is arguing this and see what you can do today to avoid this pitfalls. You’ve been hearing about self awareness and how important it is to have. But this is easier said than done. Why is that? What exactly makes it so difficult for you to achieve a higher level of this amazing quality? We go over that and more so that you can deepen your understanding of this kind of emotional intelligence. What are the secrets to motivation? This is a question that haunts everyone with a goal. While no one has all the answers, here are a few that many people overlook when they approach their goals. If you have found yourself struggling with finding motivation, you’ll appreciate the different tips here. Why are you the average of the people closest to you? I’m sure I’m not the only person that’s been curious about that. From my own childhood memories to research that study how the people around us affect us, I offer a glimpse into how we’re impacted by others and why. And most important, how you can use your emotional intelligence to balance out what we call social contagion. If you were to give a speech to new college graduates, what would you say? That is exactly what went through my mind at my little brother’s graduation. Not surprisingly, what I would say is very different than what you hear at most universities. Here is what I would say. What does EQ have to do with poker? A lot actually. We invite professional poker player, commentator and team manager, Ricky Guan here to talk about a side of the game that you’ve never seen before. From his past had an impact to what he’s learned throughout his journey, you’ll definitely discover new perspectives you never had. “For nothing is ever good or evil…but thinking makes it so.” This quote by Shakespeare rings true for everything in life, including EQ. Even something as crucial and human as emotional intelligence is to success and happiness, it has a dark side. Since I’m all about the perspective, I dive into the side of EQ you don’t see as much. Beware the darkness. What did a dragon make me realize about complacency? Quite a bit actually! With a story that struck me to the core, I realized the dark side of human adaptability. To counter that, I talk about self disruption and some of the elements that go into that. If you’re looking to break out of feeling stagnant, this will be the show for you. In a world that is increasingly being defined by the advances in technology, where do we as humans stand in all of this? Will emotional intelligence still be relevant? What perspectives or mindsets can we take to avoid being swept away by the constant waves of change? This episode answers all those questions and more. For many people, holding yourself to high standards is a way to not fall into complacency. Some people even use this to push themselves. But when taken too far, this can do more harm than good for you. Unfortunately this happens more frequently and subtlety than we realize. How do you know when your inner critic is going too far? What can you do with emotional intelligence? What would your personal relationships, career or business look like if you developed more of your EQ? 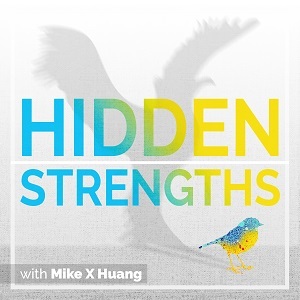 This podcast will take you through the science and the stories of how you are capable of more than you think.